Take your vault to the next level with the NEW AAI Evo-Boards! Stop pinching fingers or bruising knuckles and join the evolution in vaulting. The Evo-Board provides predictable and consistent rebound action giving maximum return of energy input. Normal springs wear down due to metal fatigue caused during compression. The Evo-Board uses the next evolution in leaf springs to remain consistent and last longer. Which board to choose? There is no specific weight limits, it more on skill level. There are many gymnasts that are good vaulters and would like the Yellow (Medium) Evo-Board, for example. The key, like so many things in gymnastics, is their skill set. > Evo-Boards have a Larger Sweet Spot allowing for variation in entry positions. 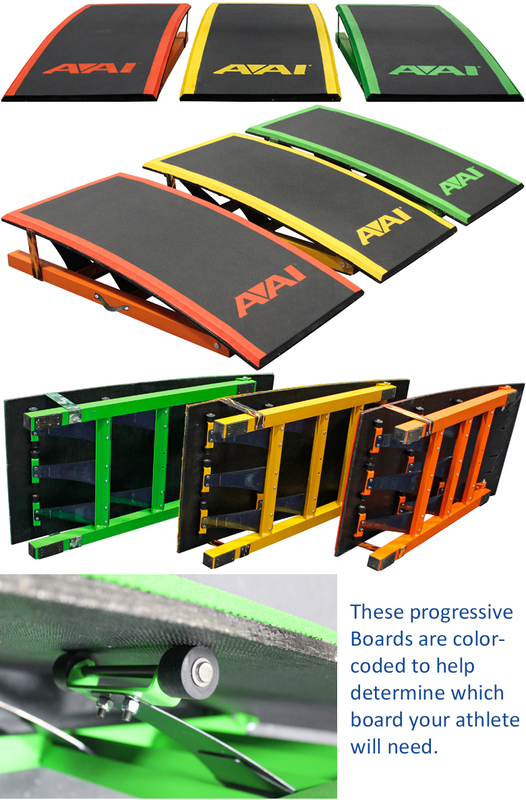 > These Progressive Boards are color-coded to help determine which board your athlete will need. > Softer and less jarring feel allowing for more repetition. > Welded aluminum frame with handle for easy transport. > Anti-fatigue mat provides a unique softer feel on hands or feet. > No more changing springs or worrying which spring goes to which board or in which position. Shipping is included inside the US (lower 48 states).